The Eschtivus Foundation was founded in memory of Tom Esch, who passed away from colon cancer in 2010, less than two months after his 31st birthday. In response to Tom’s diagnosis of stage IV colon cancer in March, 2010, several of his friends planned the inaugural Eschtivus Golf Classic to help with medical costs. Tom died just one month before that first event in September. 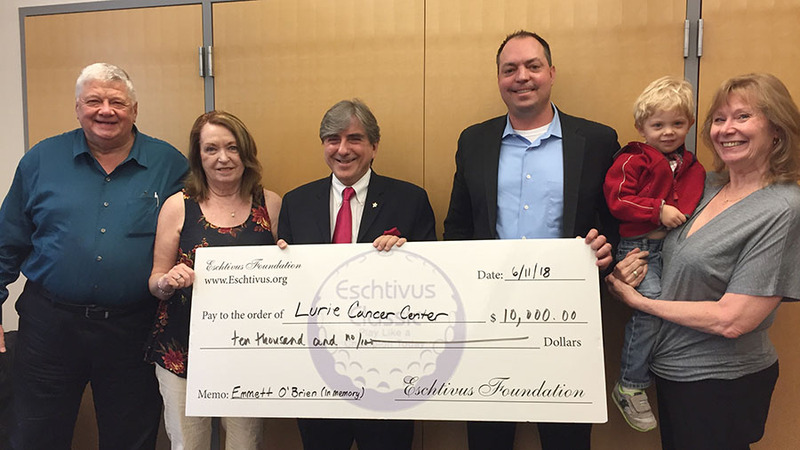 Since then, with the help of Tom’s family, friends and coworkers, the Eschtivus Foundation has hosted the annual golf outing, raising more than $40,000 to advance cancer research at the Lurie Cancer Center. On June 11, 2018, they presented Leonidas Platanias, MD, PhD, director of the Lurie Cancer Center and the Jesse, Sara, Andrew, Abigail, Benjamin, and Elizabeth Lurie Professor of Oncology, with a check for $10,000. The Ninth Annual Eschtivus Classic will be held on Friday, September 21, 2018 at Tamarack Golf Club in Naperville.